James Maitland Stewart, one of the most likable and versatile actors in motion picture history, was born on May 20, 1908 in Indiana, Pennsylvania. He appeared in over 80 films during his long career. Stewart is most loved and fondly remembered for his various portrayals of Mr. Every Man, a simple, hard-working American guy slightly befuddled by the ever-changing world around him. Jimmy Stewart’s early years were akin to a Norman Rockwell painting. Dad Alex owned the local hardware store, a family-run business and neighborhood institution since 1848. His mother Bessie was described by the local newspaper as “a lady of regal bearing, dignified, and quite proper.” The couple raised Jim and his sisters in a close-knit, seemingly happy home. Young Jimmy excelled in baseball, football and track throughout his schooling. He went on to Princeton University and earned a degree in architecture. Princeton is also where he developed a serious interest in acting. During the summer of 1932, he took several small parts in his friend Josh Logan’s University Players drama company in Falmouth, MA. Shortly after, he moved to New York City and became roommates with Logan and another member of the University Players, Henry Fonda, who turned out to be his life-long best friend. Stewart landed a few parts during the early 30’s, but times were tough during the Depression. But when MGM gave Jimmy a screen test in 1935, his naturally diffident, casual drawl and easy-going manner gradually brought him better roles and greater success. By 1939, Stewart was a major star after starring roles in two Frank Capra films, “You Can’t Take It with You” and “Mr. Smith Goes to Washington”. For the latter, Stewart received the first of his five Best Actor Academy Award nominations. In 1940, Jimmy gave a career-defining performance in “The Philadelphia Story,” co-starring with Katharine Hepburn and Cary Grant. He won the Oscar for Best Actor in 1941, his only competitive win. Stewart was at the height of his career when he put it all on the back burner to join the Air Force in March 1941 (he had to put on 10 pounds to meet the weight requirement). He served as a flying instructor, and later as a pilot of B-24 bombers. During the final two years of WWII, he was stationed in England where he led his squadron on over 20 missions to Germany and occupied France. He was the first Hollywood star who volunteered to serve, and the only one to achieve the rank of Brigadier General in his lifetime, rocketing up the ranks, not so much because of his star status, but because of his actual combat actions during the war and after. 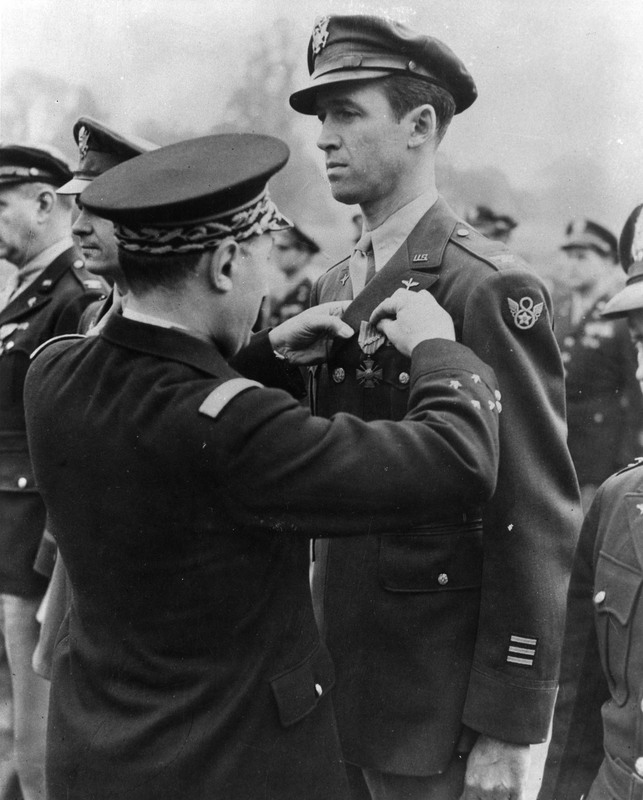 Movie-goer’s tastes had changed after the war, and the war had changed Jimmy Stewart. The parts he chose in the post-war era were darker and more complicated, and provided Stewart the opportunity to prove his ability extended far beyond playing characters that exuded “aw, shucks” charm. Classic Hitchcock movies including “Rear Window” with Grace Kelly in 1954 and “Vertigo” in 1958 showcased Jimmy’s versatility and depth. Jimmy spent years as Hollywood’s most eligible bachelor, and he romanced some of the silver screen’s most lovely ladies – Marlene Dietrich, Norma Shearer, and Olivia de Havilland, to name a very few. But he finally settled down in 1949 at 41 and married former model Gloria Hatrick McLean. He adopted her two boys from a previous marriage, and the couple went on to have twin girls. In the 1960s, Jimmy made a series of westerns and then made the move to TV in the early ‘70s. 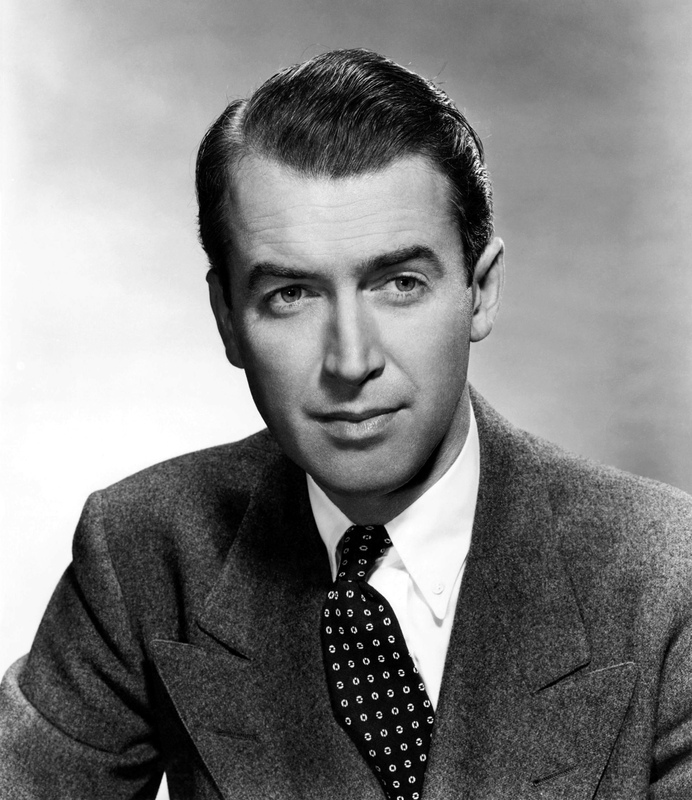 He had his own program “The Jimmy Stewart Show”, and a thriller series “Hawkins” which won a Golden Globe award. He (mostly) retired from acting in 1983, and devoted his time to the lecture circuit and hanging out at the White House with his pal Ronnie Reagan. His final film role was as the voice of Wylie Burp, in the 1991 movie An American Tail: Fievel Goes West. His wife Gloria died in 1994 ending their 45-year marriage, which was a devastating blow for Jimmy. His health began to fail not long after, and he died of a blood clot in his lung on July 2, 1997. But for most of us he’ll live on as George Bailey (and other plucky fellows), an ordinary guy with extraordinary gifts. In It’s a Wonderful Life, Donna Reed really did manage to hit the window in the first take of the scene where she makes a wish and throws a rock at the house. Originally, they had planned to have her throw it and then had a sharp shooter standing by to shoot the window at the appropriate moment, to make it appear the rock had broken it. This turned out not to be necessary as Reed had quite the throwing arm. Not just a good thrower, Reed grew up on a farm and, on a bet from Lionel Barrymore, demonstrated how to milk a cow on the set of It’s a Wonderful Life. He was an AMERICAN that made us all Proud to be an American….An example to follow and a gift to be treasured by all.. In a long paragraph, the final sentence (“He was the first …”) is a bit misleading, because it makes it seem as though Stewart joined the armed forces as a reaction to the bombing of Pearl Harbor (at which point the U.S. entered the war). In reality — as the first sentence shows — he had ALREADY joined [the U.S. Army Air Corps — NOT “the Air Force”] about nine months before the attack by Japan. Since he was already in uniform on December 7, 1941, it was impossible for him NOT to have been “the first Hollywood star who volunteered to serve”!